With pollution reaching levels never before seen and having a major effect on our environment, it is more important than ever to do what we can to stop it. Most people do not realise it, but they can do something right now to improve the environment by going “Carbon Neutral”. Going carbon neutral means that you produce almost no carbon emissions through your day-to-day activities. You then completely clear your carbon debt by purchasing carbon offsets. This means you have no carbon footprint and you are not contributing to the problems of carbon pollution in our atmosphere. The Green Temple is located at The Conscious Club, the showcase of the new sustainable future. 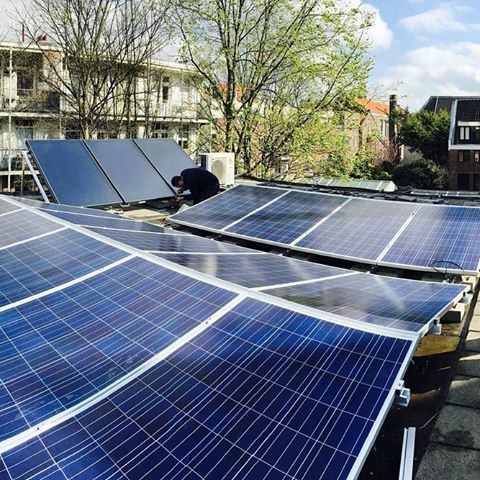 The Conscious Club is the first public climate neutral canal house in Amsterdam. This former chocolate factory is rebuild with a super high-tech sustainable climate system. Only natural products have been used to build a sacred space. Not only a conscious design but also one with soul through the amount of antique details and items with a story. The sun generates more electricity in one hour then the world needs in an entire year. The solar panels on top of The Conscious Club cover their full usage of electricity. Eneco supplied this innovative system, to make sure The Conscious Club is self sufficient and ready for the future. Although the production of solar panels does require some inputs of raw materials and energy, solar power’s environmental impact is minimal. The technology produces none of the carbon, methane or particulate emissions that fossil fuels emit, and it doesn’t demand large-scale mining or drilling operations. Since panel arrays can be placed on rooftops or in isolated desert areas, solar power’s physical footprint is manageable as well. Traditional heating on the Amsterdam canals is being done with a gas boiler, but even the very economical ones still emission CO2. To make sure we don't leave a carbon footprint we have a high tech climate installation by our friends of BLR-Bimon. We use electrical heating in combination with a heat pump and our heat pump works from the energy generated by our solar panels to make sure our building is energy neutral. We use a hybrid climate system that automatically adjusts by measuring the outside temperature. Only on the coldest days we make use of the newest and most economical boiler from Remeha to get some extra heat in the building. Did you know that all of our hot water comes from their Solar Pro tank and solar collectors combined with a high efficiency hot water boiler. With this system the maximum energy label of A+++ has been realised.